Robert Wuthnow shows how music and art are revitalizing churches and religious life across the nation in this first-ever consideration of the relationship between religion and the arts. 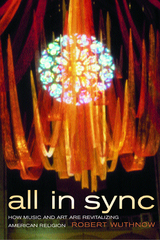 All in Sync draws on more than four hundred in-depth interviews with church members, clergy, and directors of leading arts organizations and a new national survey to document a strong positive relationship between participation in the arts and interest in spiritual growth. Wuthnow argues that contemporary spirituality is increasingly encouraged by the arts because of its emphasis on transcendent experience and personal reflection. This kind of spirituality, contrary to what many observers have imagined, is compatible with active involvement in churches and serious devotion to Christian practices. The absorbing narrative relates the story of a woman who overcame a severe personal crisis and went on to head a spiritual direction center where participants use the arts to gain clarity about their own spiritual journeys. Readers visit contemporary worship services in Chicago, Philadelphia, and Boston and listen to leaders and participants explain how music and art have contributed to the success of these services. All in Sync also illustrates how music and art are integral parts of some Episcopal, African American, and Orthodox worship services, and how people of faith are using their artistic talents to serve others. Besides examining the role of the arts in personal spirituality and in congregational life, Wuthnow discusses how clergy and lay leaders are rethinking the role of the imagination, especially in connection with traditional theological virtues. He also shows how churches and arts organizations sometimes find themselves at odds over controversial moral questions and competing claims about spirituality. Accessible, relevant, and innovative, this book is essential for anyone searching for a better understanding of the dynamic relationships among religion, spirituality, and American culture. Robert Wuthnow is Gerhard R. Andlinger '52 Professor of Social Sciences and Director of the Center for the Study of Religion at Princeton University. His most recent books are Creative Spirituality: The Way of the Artist (California, 2001), Growing Up Religious: Christians and Jews and Their Journeys of Faith (1999), After Heaven: Spirituality in America since the 1950s (California, 1998), and Loose Connections: Joining Together in America's Fragmented Communities (1998).